Katy Plant won first prize in our Express Yourself 2017 student art competition. Due to the success of our first exhibition, we decided to hold the competition again in 2018. 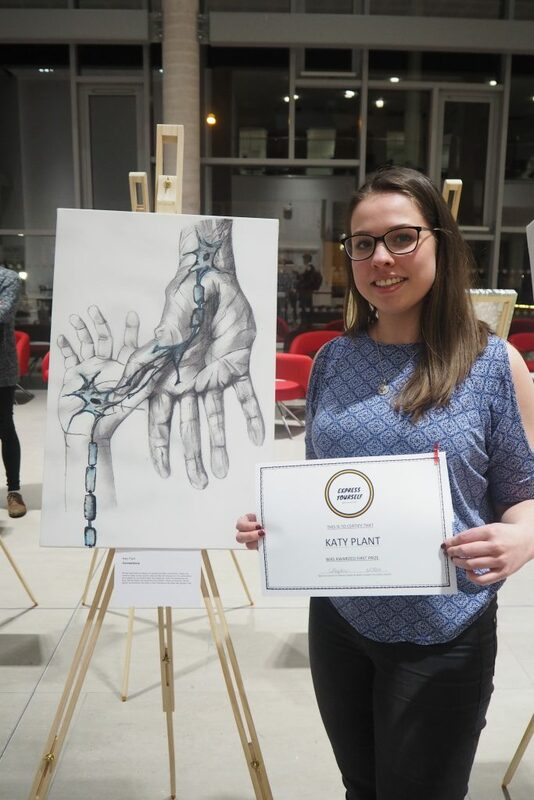 Katy has kindly shared her experience of taking part and taking home first-prize in 2017. Art has been my thing from day one as a child, always drawing and experimenting, but I fell away from art after completing my GCSE. Having not touched a pen or paintbrush since, I was keen to get back to get to the hobby but needed a project – something to work towards. The Express Yourself art competition popped up on Facebook and I thought £20 pounds worth of vouchers if I win this art competition? Well why not, but what do I say about mental health? Mental health stigma is reducing and even though I’ve been taught about mental health through studying medicine I was daunted by the prospect of tackling a piece on this topic. I think if it had been about broken legs or arms I wouldn’t have felt worried but there’s something different about commenting on a brain being broken. It even feels jarring to say that, because the brain isn’t just an organ it’s a person’s mind, personality, ideas, creativity. Connections sparked from the idea of balancing the role of biology in mental health and personal interactions. I wanted to express how mental health is not solely medical or solely social. My initial interest in the competition was selfish – to improve my art and maybe get some money. The journey of creating the piece however completely changed my mindset and I felt very passionate about the message I wanted to portray. There were so many wonderful pieces of art, coupled with inspiring personal stories of struggles with mental health. I felt undeserving, how can I win a competition about mental health when I’ve never suffered problems with my own? We are hard-wired by billions of neurons and their connections. These connections make us who we are, what we feel and how we act. Our connections are sculpted by our environment, the people we meet, the experiences we have. Mental illness can result from any break in these connections, the biological connections in the brain or the connections we make with people in life. Others had drawn about their experiences of having family or friends with mental health conditions. I was surprised that idea hadn’t even crossed my mind when brainstorming. Someone very close to me has struggled bravely with mental health issues and I am immensely proud of their strength and courage. I have witnessed first-hand the pain mental illness has caused for them. Their illness is so emotive for me, I was shocked that the idea of drawing or painting about them only crossed my mind when I saw others creating images around similar situations. At that moment I realised the reason it never crossed my mind is that they have never been their mental health to me. It is not their personality, it is not their identity and the memories I have with them are full of joy despite the hard times. 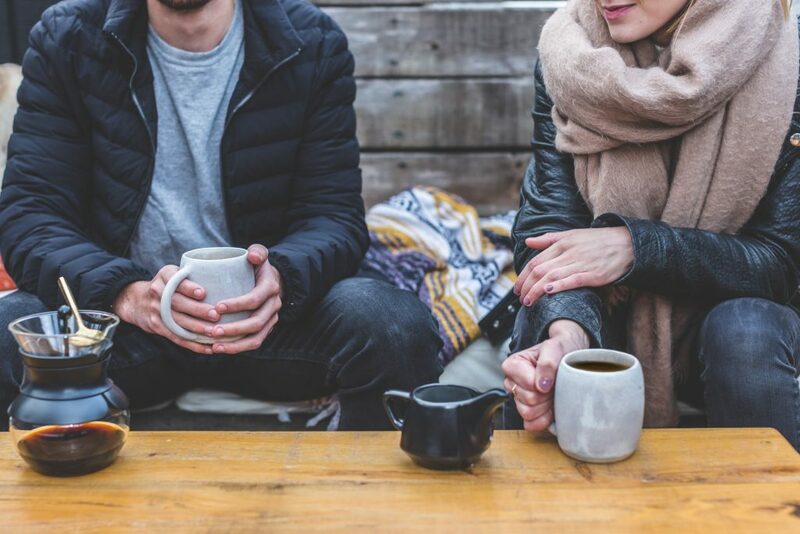 It is not just the biological connections that makes us, it is also the connections we have with people in our lives, the relationships. I was so adamant I hadn’t won that when they called my name and my friends whooped like football hooligans in an auditorium surrounded by civilized people holding glasses of wine I was slightly embarrassed. However, I was also honoured to have been given first prize and privileged when Laura from My Discombobulated Brain said it resonated with her. I realised mental health isn’t just about the person with the illness, everyone has a duty to be aware of mental health issues. This competition vastly improved my understanding of mental health and I can’t thank that £20 voucher enough for teasing me in because what I’ve learnt is invaluable. See the entries from 2017 and 2018 on our Facebook page. Katy is a medical student at Cardiff University.